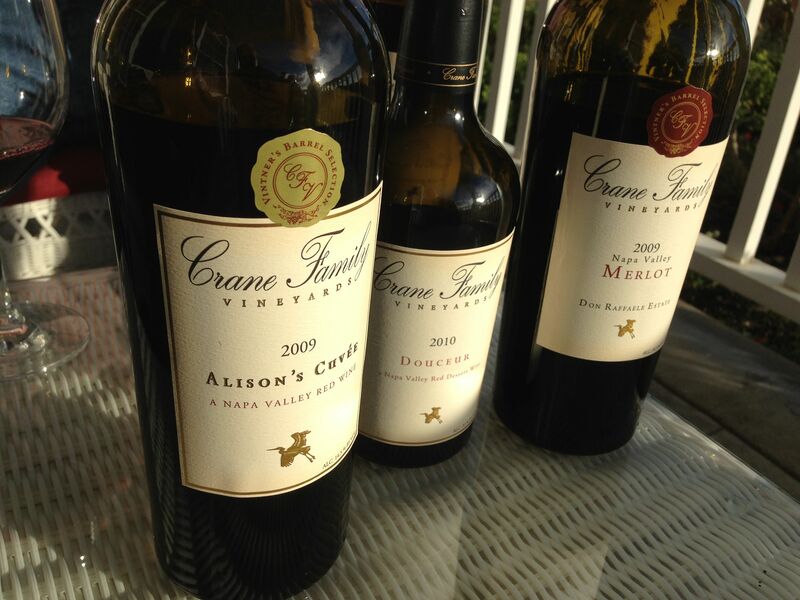 Only 5 minutes from The Inn On First, a romantic Napa Bed and Breakfast Inn, is the Crane Family Vineyards Estate. Sitting on a small hillside, overlooking parts of the city of Napa and the surrounding hillsides, you appreciate that this is a great place to live. In the back of this small property is a barn that serves as the winery, where the Cranes have been producing wine for over 20 years. These are the gems we long to find and so appreciate when they come our way. Tom Chiarella, son of the founders of the winery (Crane is his mother’s maiden name), is now running the operation and after a tour of the property invites you to sit on the front porch and to taste their wines. 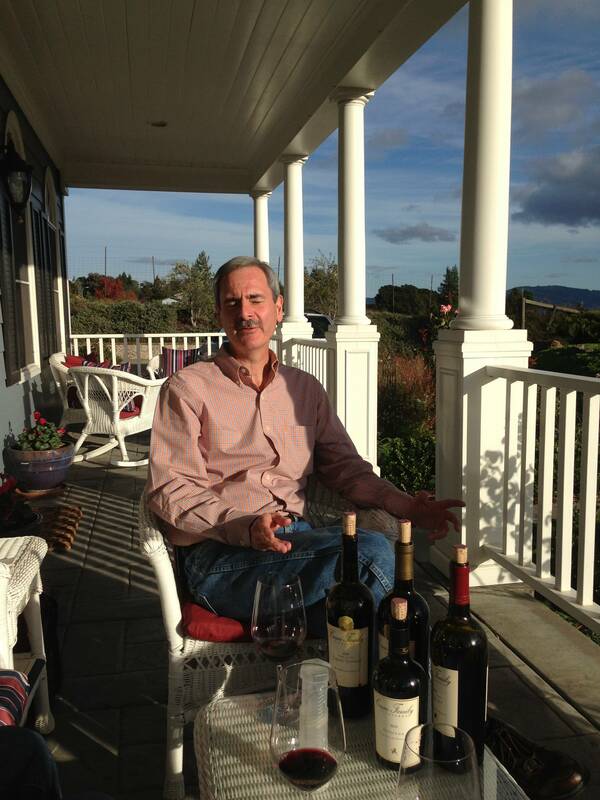 An affable fellow who makes you feel comfortable and welcome immediately, he recreates for you a bit of the history of the land, its owners (his parents), and his years in Napa Valley. Over the course of conversation he pours you a glass of their estate Merlot, their Cabernet Sauvignon, Alison’s Cuvee (the winemaker’s play yard of wine with her Cabernet blend that changes every year), and the family Port. These are unpretentious wines presented by an unpretentious host, and it makes for a unique Napa Valley winery experience. They make few cases and don’t have many appointments to offer, but for the wine enthusiast looking to purchase wine Tom is always willing to share a part of his day with you. Prices range from $35 for the Port, and $50 to $80 for their other wines. 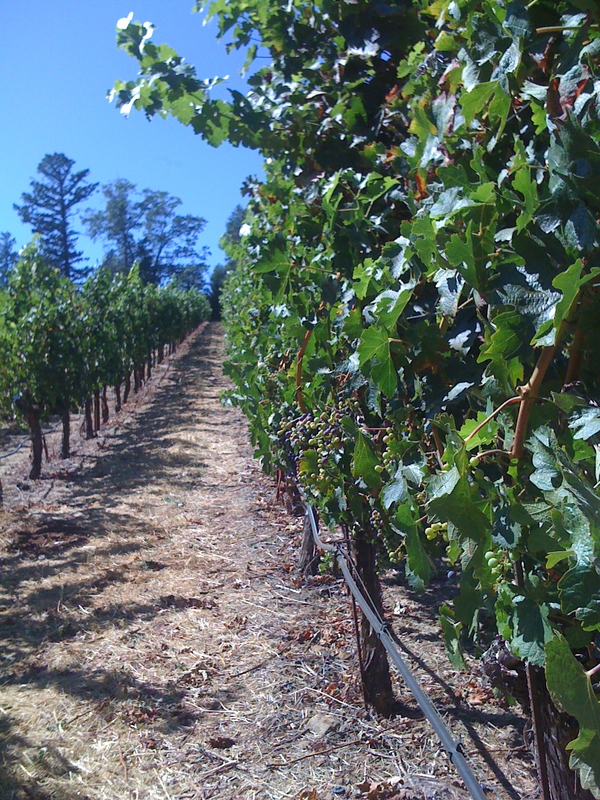 By the time your visit is over you will forget that you are so close to the city of Napa. You will be enthralled with the views, the ambience, the friendliness, and the wines. You will understand why we love Napa and its residents. Definitely a gem not to be missed. As we left for the day from The Inn On First, a luxury Napa Bed and Breakfast, we knew we were in for a real treat with our upcoming vineyard lunch. You enjoy as much wine as you want from each bottle they open for you to try. You eat to your heart’s content with incredible food from Ken Frank of La Toque. You look down upon the beauty of Napa Valley and think: “Oh my! I’m so lucky to be in Napa!” You are one of the few who have discovered and enjoyed the uniqueness of Napa Valley at its best. Chateau Patel-VGS. Vineyard Lunch. It began with a drive up Mt. 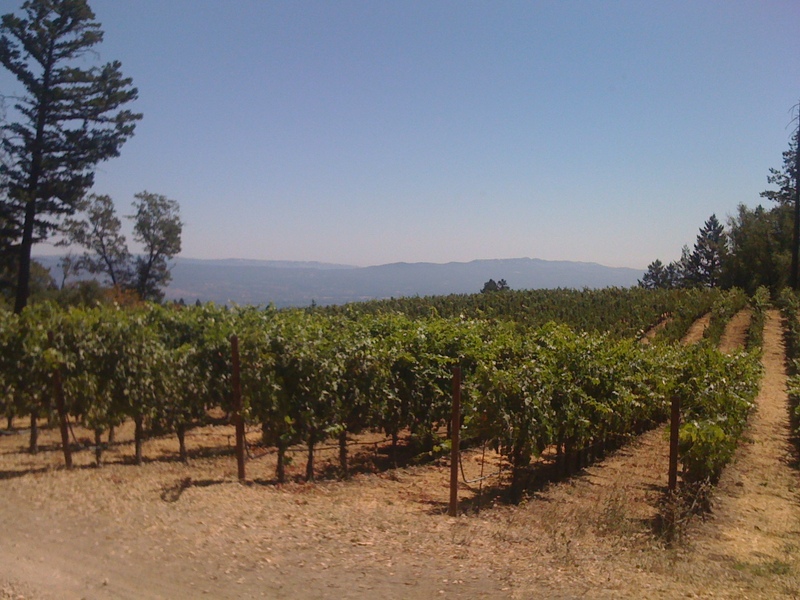 Veeder and down a long, dusty road to a gated vineyard. We met Tony, an affable man with a great smile, and he opened the gates and invited us to follow him. We traversed the rows of cabernet grapes, and when we spotted the pink flag on one of the stakes he proudly proclaimed: “Pick a row! Climb the mountain.” We did. It wasn’t a long climb, about 50 yards, through the vines ripe with fruit, purple and luscious, hanging, waiting for you to enjoy their bounty. I can see why tennis shoes or good hiking shoes are a must. We found a dirt road on top and followed that up another 50 yards until we found the arbor, built specifically for this purpose. A table, white linen table cloth and napkins, with wine glasses, silverware, and plates awaiting the diner. 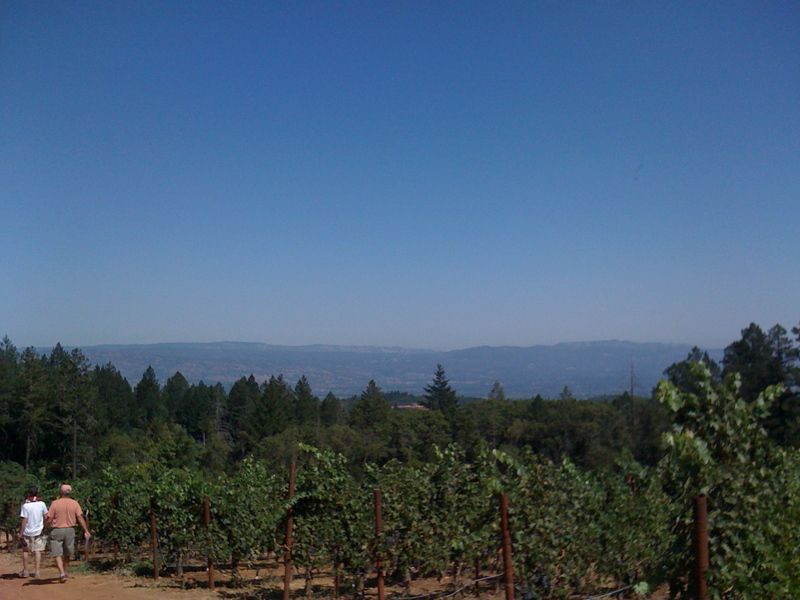 As well as a gorgeous view of Napa Valley and the surrounding vineyards. We started with a salmon spread and toast points served with their VGS Explorer Sauvignon Blanc ($25). A crisp wine with smells of lightly buttered toast and hints of lemon went well with the salmon. We followed this with a lovely green salad, blue cheese, candied pecans and a balsamic vinaigrette served with the VGS Chardonnay ($45), with notes of pear, green apple, and honeydew. A beautiful combination of food and wine. We also paired this and the next course with their cabernet-zinfandel blend called “Illegitimate” (2009) ($37). Fruity, with flavors of tart cherries and spice, very fruit forward and big fruit flavors. Our main course was beef carpaccio, potato salad, and marinated vegetables served with the Illegitimate and their VGS Syrah (2009) ($75) with big fruit flavors, lightly spiced, and extremely delicious. Of course there was still the cheese course with cranberry nut bread, nuts, and three beautiful cheeses. All that could be paired with what we already had open. But then Tony opened a bottle of their late harvest zinfandel, called “Zinie” (2010) ($28). Low in residual sugar and not at all like many of the dessert wines we’ve had elsewhere, it was an incredible pairing with the cheese and bread. Swanson Vineyards: not a tasting room but a salon. Swanson is a small family owned winery in Napa Valley that has a most unusual set-up. The tasting salon sits in the middle of vineyards they do not own (their vineyards are behind Brix Restaurant), and the decor in the salon is really unique. Painted in bold colors, with large whimsical portraits of people and grapes and wine, it is bright and cheery as you enter the room and find yourself greeted by Cidy or Sean who immediately invite you to sip a little Pinot Grigio and stand by the open fire. Since it was a cool Napa day it was a wonderful greeting. This was a hospitality event to introduce us to their salon and how they do tastings, and Cidy took responsibility for each person at the door to invite them to enjoy the food that was being paired with the wine. The Pinot Grigio with deviled eggs and caviar (my mouth still waters) and the salmon crostini with a housemade ricotta-like cheese, the Merlot was paired with pork sandwiches as well as cheese and crackers, and finally the Alexis (mostly Cabernet Sauvignon) blend with homemade chocolate truffles dusted with curry powder. They all worked beautifully. Alexis Swanson works closely with the chef to create this pairing and it creates a great time for everyone. Normally guests will sit at the tasting table (only 10-12 allowed per session) and will enjoy about 90 minutes of tasting wine and eating food and receiving a great education on wine and food pairing. They only do a few sessions per day and to make reservations you need to call weeks in advance, especially during the summer. Although we haven’t done the tasting experience…yet!…we were really impressed by what we saw and experienced. Other guests have gone throughout the past year and have really enjoyed their time at the salon. The cost is $30-$55, depending on the number of wines and foods you pair with during your tasting. For a small boutique winery, this really works well for guests to have a different kind of experience in Napa. We were invited to a hospitality event at Folio this past week to learn more about what the Robert Mondavi family is doing with their latest private venture in winemaking. The tasting room is set in the Carneros region and we drove back over the rolling hills, Jamie and I both were amazed at how beautiful the Carneros region is just for driving. Arriving at the tasting room we were faced with a very large display of wines to taste, somewhere around 30. Folio carries multiple labels and each label focuses on a different varietal, or blend, or even region of the Napa Valley. I was poured a tasting of the Oberon Cabernet, which had a very subtle berry tone that lingered in your mouth well after you swallowed. With light tannin it was the perfect complement to the cheeses, salamis, and bread they offered you to eat. Behind the tasting room I was pleasantly surprised by the art display, where local artists are given an opportunity to showcase and sell their art through the winery. 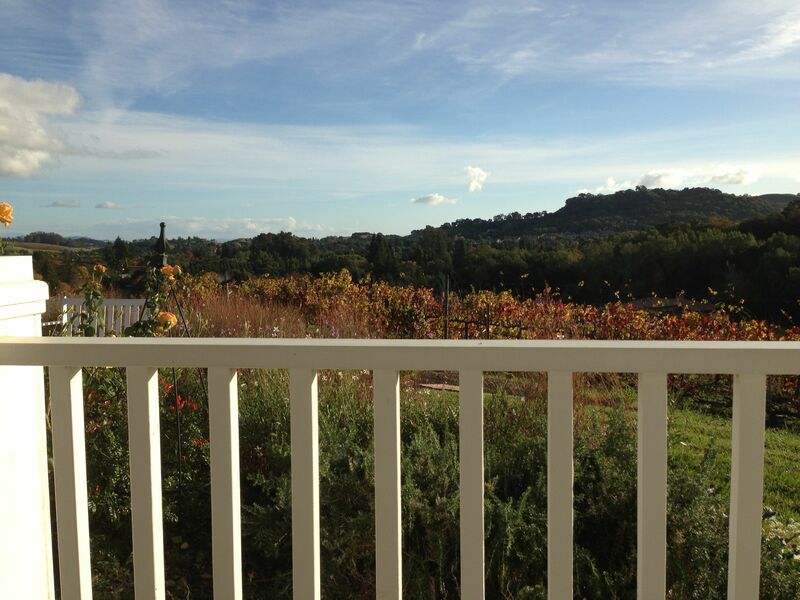 Then- this was the best part!- you walk out the back door and sit on the veranda that overlooks the vineyards. If we didn’t have anything else to do we would have easily spent an hour just sipping wine and enjoying the view of the rolling hills, the blue skies, and the yellow mustard growing up between the black and pruned vines. I tried one other Oberon Cab and learned a little bit about what it means for a wine to be “fruit forward”. The nose and immediate flavor on the second Cab was strong and bold, not as subtle as the first one. ”Imagine,” Mike the tasting room manager said, “enjoying this with a tomato based sauce like Cioppino. You want the fruit to a little strong so it can meet the flavor of the sauce.” A light went off in my head. Aha! Another Napa Valley lesson learned. We left Folio and headed for Artesa, a short drive up the road. Not very distinct from the distance, and appearing like a bunker as you drove closer, we were impressed by the stunning views when we arrived, as well as the way they built the winery into the hillside to blend in with nature. The views alone are worth the trip as you can see all the way to San Francisco and all over the Carneros region. 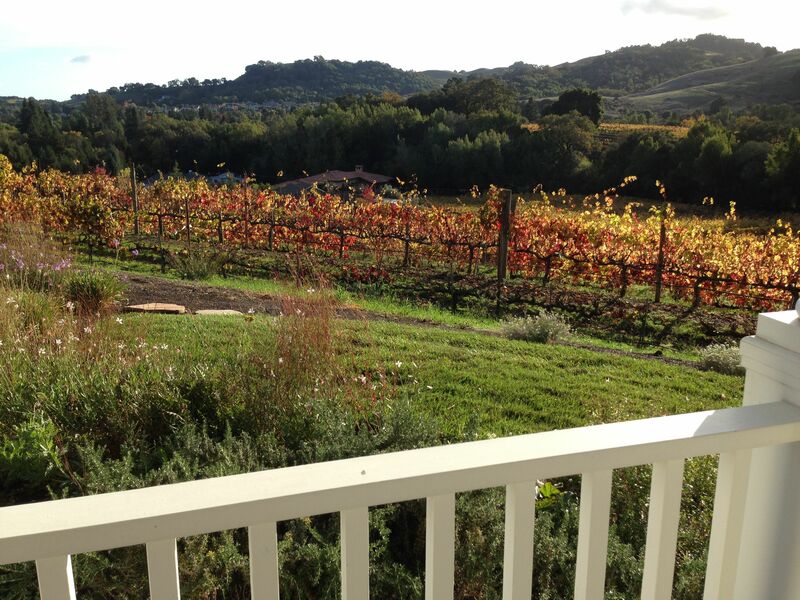 I enjoyed their Reserve Cabernet as I sat out on the veranda overlooking this great view and, like Folio, imagined that I could easily spend an hour with a bottle of wine and good friends just sitting down and embracing the day. The other thing I like about Artesa is that they offer a sparkling wine on their menu, something not seen beyond Mumm Napa, Schramsberg, and Domain Chandon. I’m still looking for others that provide it. Platypus Tours: a drive to remember. We have been fortunate now to have taken Platypus Tours twice in the last nine months. The first time was for a friend’s 60th birthday party and we were introduced to such wineries as Arger-Martucci (love it! ), St. Clement (a great picnic place) and Paoletti (another great place, but not open all the time). For $75 per head, they drive you from 10:30 in the morning until 5:00 in the evening, touring anywhere from three to eight wineries, depending on what the group wants for their experience. Lunch is provided, and tasting costs are your responsibility, but most places forgo the tasting fee. You drive in a luxury van with leather benches, with water, cheese, and crackers served all day. They are knowledgeable about the Valley and are able to listen to the needs/desires of the group they are driving and will accommodate changes at the last minute is they feel it will serve the group better. 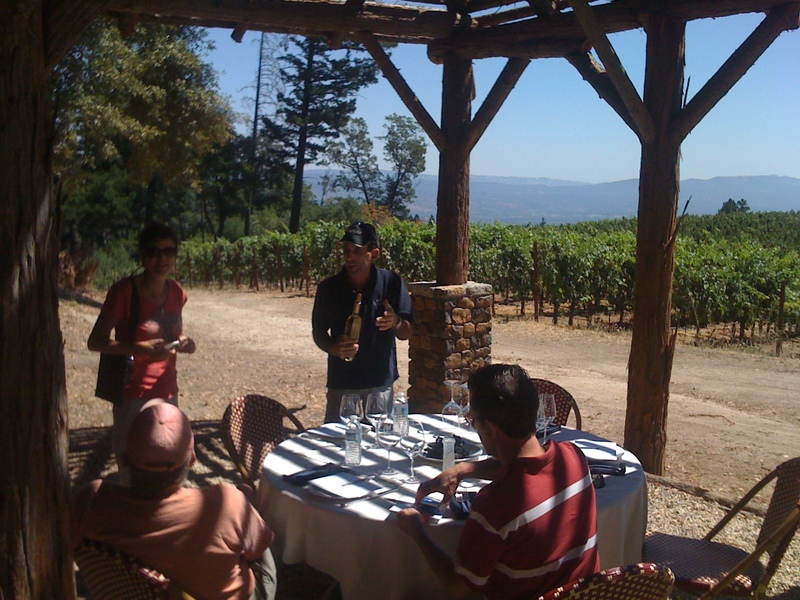 No more than 10-12 people on the tour, it is a great way to sit and enjoy a drive through the valley and be able to taste wine all day without worrying about driving home at the end of the day. This past week we toured a second time, this time with our housekeeping staff, specifically to wineries that could provide information in both english and spanish. We visited Bourassa (a real surprise in the tasting room as you enter the warehouse and suddenly feel that you are hidden in a deep cavern with candlelight) and we fell in love with their 2005 Reserve Petite Syrah. Then we visited Ceja, a winery started by a Mexican family whose father started in the valley by picking grapes at local Napa wineries; eventually learning the whole business which allowed him to open his own winery years later. They have a very unique Pinot Noir that surprised me by its understated elegance. I’m not a Pinot drinker per se, unless I taste something really nice. This was really nice. We finally reached Buena Vista in Sonoma, the oldest winery in California- 150 years. A lovely picnic ground next to the creek provided the background for lunch. I liked the wine, although I wouldn’t necessarily say that it stood out with distinction. It was solid. We did visit one other winery in Sonoma, to remain unnamed, and we did not like any of their wine. When you come to visit I’ll tell you; but I don’t want to besmirch anyone’s winery or wines. To each their own. This just wasn’t for me. Too much herbaceousness going on; bell pepper (don’t like it! ), and the port was fortified with brandy and was too “hot”. Our housekeeping staff enjoyed their time as it gave them a feel for what our guests experience when they take this tour. When I asked if they would recommend this for our guests in the future, the answer was a loud and definitive YES. Platypus, we thank you for once again giving us a great tour of the region. The Napa Valley Grille, Yountville. I was told by a friend that the Napa Valley Grille in Yountville (www.napavalleygrille.com) was a great place to eat; paying close attention to the braised short rib. When our friend, Patricia Blair, came to visit, we decided it would be a great time to try it out. Only a short 15 minute drive from The Inn On First we enjoyed a semi-filled parking lot which meant easier parking than in the summertime. Entering the double door brings you into a cozy and inviting ambience with wood and beige overtones. We found the menu interesting and exciting, with such entries as sweet potato bisque (yummy!) with a small, cold custard in the middle with a vanilla-chili oil vinaigrette. Jamie and Patricia both enjoyed the Mizuna and Mustard Greens salad with pomegranates and a vinaigrette. Jamie ordered the crispy duck breast on top of grandma’s scalloped potatoes (a great complement to the duck), while Patricia and I both enjoyed our braised short ribs that had a hint of chocolate and pepper, served with soft polenta, and a huckleberry compote (great combination!). We paired the meal with Pine Ridge Cabernet (www.pineridgewinery.com) , a nice selection for the braised short rib, but I think less so for the duck. We were told the short rib was the dish specifically designed with the Pine Ridge cabernet in mind. I thought it was adequate, but that there could have been a better selection. It seemed to me that the Cabernet got lost in the seasonings of the rib and didn’t do much to work with the huckleberry. Granted I’m still fairly new to wine tasting as a hobby, but I think something with a bit more oomph (see what a novice I am! I don’t even know what to call that oomph!) would have been better. Compared to the CIA, Wine Spectator Greystone Restaurant, this was a little less impressive on the food, but the ambience, being smaller and more intimate, more in line with what we like. We will be going back in January to enjoy the discount coupon they offered us on the way out. We’ll see if it holds up the second time around.